General facts: This is a blended malt Scotch whisky, which means that it consists of malt whisky from different Scottish distilleries (Glenfiddich, Kininvie and Balvenie, to be exact) and is bottled by William Grant & Sons. The whisky from the three distilleries is matured in bourbon casks and has been married together in a vatting tun for three months prior bottling. This specific bottling is batch number 27, and since the ABV is at 40% I dare assuming the whisky has been chill-filtered. Don’t know if artificial colouring has been added. Interesting fact – “Monkey shoulder” is from the beginning the name of the injury many of the men got when turning the malted barely on the malting floor. A bottle costs around £30 and this specific sample is a cute little mini bottle I picked up for a pound or two in Great Britain. Nose: Slightly perfumed, a lot of fresh apple, some sweet waffles and a touch of syrup. Fresh pear and also some whiteboard pen. A lot of fresh fruit overall, and a pretty compact nose actually. Almost a bit oily, in a way. Oh, and an earthy note too, but in a good way. This is a classic, fruity but robust nose. Not super complex, but it smells pretty nice. With water there’s less “apple bomb” and more sheer floral notes with more vanilla emerging. Pleasant! Taste: A lot of vanilla, some oakiness, and then caramel. Really ripe, fresh fruits but also some cooked vegetables. Think sweet, boiled carrots! Oily with rose peppers, both fruity niceties and a bit of earthy dirtiness going on at the same time. A bit of malt sweetness, kind of like sweet bread (Swedish syrup loaf!) After adding some water the whisky dies a bit, and is mostly transformed into an über kind vanilla-fudge-whisky without much character. When adding some more whisky to the glass the Monkey Shoulder makes a comeback with less oak, more creamy vanilla (vanilla ice-cream) and that rose pepper note I find really pleasant, but also in teh company of some orange. Finish: A whole lot of oily oak, but also vanilla sweetness and a sort of fat mouth feel of the aftertaste, which is medium long. The peppery note stays the longest together with something reminiscent of bay leaves, actually. This was a classic, straight forward and tasty. Not really complex and the whisky couldn’t quite take much water either, but I’d be happy to have a Monkey Shoulder again since I was surprised in a good way by this dram (call me old-fashioned but I didn’t really like the PR-gimmicks with people being photographed in cages and what-have-you-not). 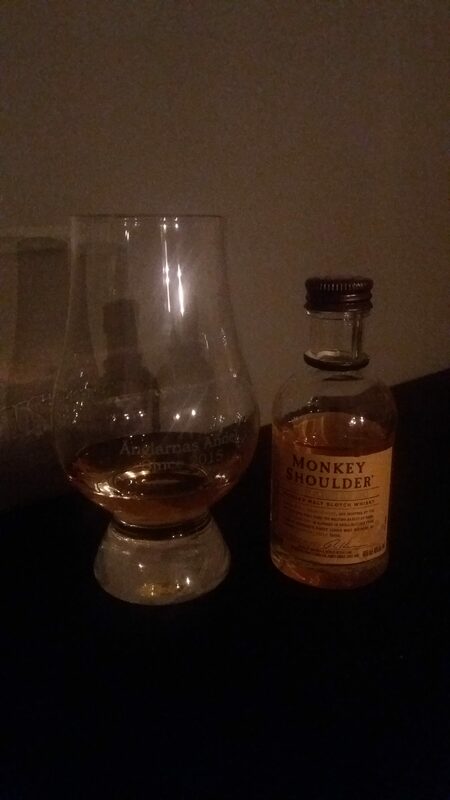 However, since it doesn’t really matter what I thing of the marketing I’ll stick to my opinions on the whisky, and as an simple but pleasant every-day-dram I’ll give Monkey Shoulder two thumbs up! © 2019 The Angels' Share. Theme by Anders Norén.